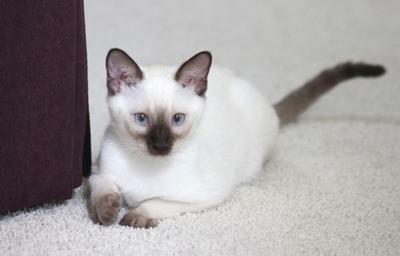 I personally think all three types of Siamese are beautiful in their own way. However, I am partial to the moderate Siamese. I think they are probably closest in type to the original imports which were described as angular and long when first imported to Great Britain. People argue that the show-style Siamese of today is most like the original but I think this is impossible as many Siamese were street cats, and thus they would have interbred with other street cats - this would make the extreme body type impossible as it would have averaged out. The English described the Siamese as narrow in the face - probably because many of the breeds shown in England at the time were stout and indeed the Siamese by comparison would have looked long and narrow. Perla May Petalpaws is my beautiful chocolate point girl. I adore her and she is every bit the Siamese queen. She loves to walk on her harness outside and sits in my lap when I'm painting (I'm an illustrator). I've never before had such a delightful cat and have loved the Siamese breed my whole life. My grandmother always had them and so I grew up with them. Thank you Danielle for your photo of Perla May Petalpaws and your thoughts. I believe you're right that the facial features and body type of the more moderate Siamese are probably likely to be most similar to the cats originally brought into the UK in the 1880s. Perla May is just gorgeous - she's a beautiful example of a chocolate point, and I love her facial markings, which many chocolate points have as young cats.